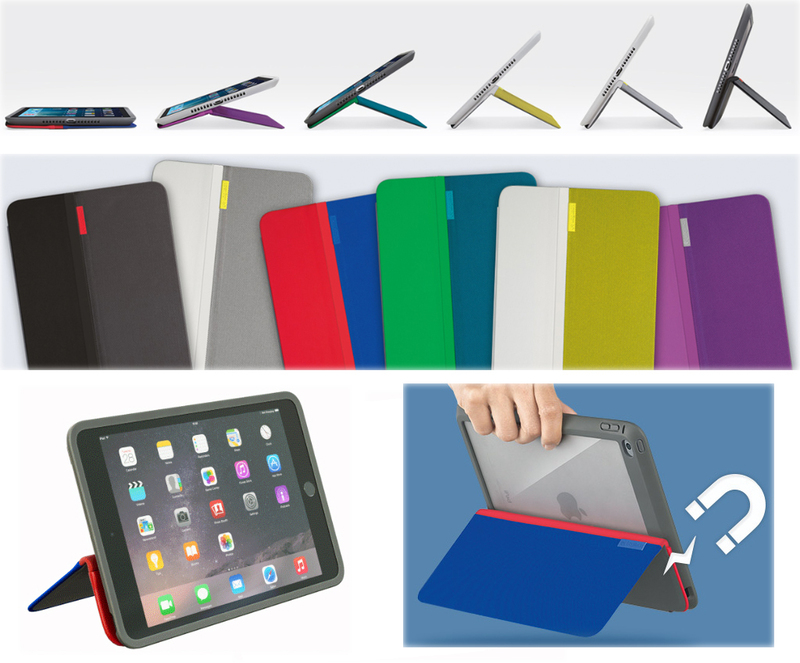 Logitech has introduced new protective cases for both the iPad Air 2 and the mini (all three versions). These cases also function as a horizontal stand that can hold your new iPad at any angle. Your device is held in a rubberized frame that protects the iPad from bumps or drops; the back is clear so you can see your iPad. The front cover has magnets that hold the cover closed to protect the screen and also activate the iPad’s sleep/wake function. The front cover also has an integrated hidden hinge that holds your iPad at any angle you select (500 range of movement), without slipping or sliding. There’s an AnyAngle case for both the iPad Air 2 and the iPad mini 1/2/3. Both sizes are $59.99, and both are available in black, red/blue, teal, gray, yellow, or violet. Logitech is taking pre-orders for the AnyAngle cases now.